Very easy to make! The shaft is just a dowel that’s been tapered with sandpaper. 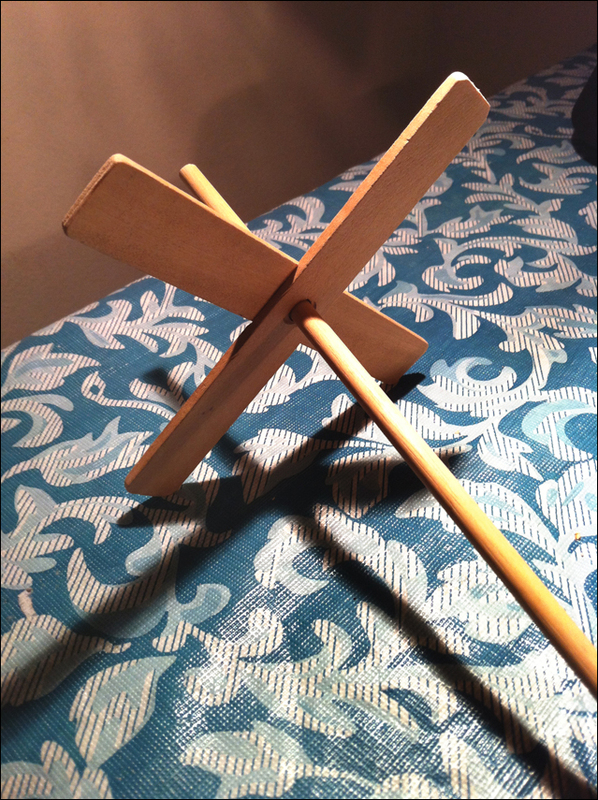 Even though I had to get creative with the holes (an awl and a wood-burning tool were involved), you could make this spindle in about five minutes with a real drill. The arms of the little guy above are joined with a simple lap joint carved with a craft knife. However, the spindle is a bit too light for my purposes, so I’ll have to add a bit of extra weight. Either with washers… or some sugru. Just a quick cop-out post update! Things have been pretty busy over here, so I don’t have a full post for you yet. However, things have been busy on the crafting front. I’ve been spending too much time around knitters: apparently, these things are contagious! I started a Henslowe of my very own last week, and revived my somewhat stale Ravelry account. There must be something in the air that brings out this interest in spring knitwear. Details are forthcoming. In other craft news: I’m still plugging away at the experimental warp on my loom, and should be on to more serious projects soon. Spinning is proceeding at its usual leisurely pace. I had hoped to squeeze enough yarn out of the Sweet Georgia roving to manage the Henslowe mentioned above, but no such luck. Finally, the treehouse project and the tapestry continue, although I need a day to sit down at the workbench to make some real progress. So, enjoy the holiday weekend, and I’ll be back with you soon. Thanks, everyone!